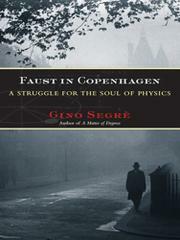 The story of a 1932 meeting at the Niels Bohr’s Copenhagen Institute that brought together some 40 physicists, among them the founders of quantum mechanics. The title comes from an impromptu spoof of Goethe’s Faust staged by the junior physicists at the meeting, lightheartedly lampooning their famous elders. Some of those “elders” were barely in their 30s, notably Paul Dirac and Werner Heisenberg, the brightest physics stars of their day. The one they all acknowledged as a father figure was Niels Bohr, host of the conference. Lise Meitner, the only woman present, was perhaps the finest experimental physicist there, or anywhere. Two giants were absent: Albert Einstein, who was leaving Europe in response to Germany’s turn toward Adolf Hitler, and Wolfgang Pauli, perhaps the age’s sharpest critical intellect. Segrè (Physics and Astronomy/Univ. of Pennsylvania; A Matter of Degrees: What Temperature Reveals About the Past and Future of Our Species, Planet, and Universe, 2002) gives a clear, non-technical summary of the discoveries and advances that led up to the Copenhagen meeting, and he explores the personal relationships of the key figures. Bohr, whom the authors of the Faust skit put in the role of God, tended to find his ideas in dialogue with others, often pushing them to the edge of exhaustion with his questioning. Heisenberg, Bohr’s prize pupil, was the most daring innovator, best known for his “uncertainty principle” defining the limits of what can be measured in physics. Dirac, whose extreme literalness became legendary, laid down the mathematical underpinnings of the new science. And Meitner was shortly to hit upon the key to nuclear fission—the discovery that transformed physics into a genuine Faustian bargain with its application to warfare. Segrè effectively combines science history with the personal lives of the conference participants, offering an enlightening look at a key event in modern science and those who took part in it.